Baahubali 2: The Conclusion has received good reviews from critics. But most of the audience had already booked tickets long before the reviews were out. There’s no doubt that BAAHUBALI-2 is Rajamouli’s most accomplished effort to date. His choice of the subject over the years has been diverse, but BAAHUBALI-2 is truly the big ticket entertainer that leaves you awestruck by its powerful storytelling and meticulous detailing. Any deterrent? The Hindi soundtrack could’ve been better, but that’s a tiny hiccup. Also, the editing could’ve been sharper at places. The breathtaking, larger-than-life frames [DoP: K.K. Senthil Kumar], grandiose and opulent production design [Sabu Cyril] and stunning visual effects impart sheen and sparkle. The action portions provide ample exhilarating moments and I must add, it commands repeat viewing. Parts of Baahubali do just that, but as was the case in the first instalment, the battle sequences are interminable and fatiguing. The film as a whole, and not just the all-out climactic war that breaks out between a good army and an evil one, demands an awful amount of suspension of disbelief. Especially superfluous are some portions of the romance that blooms between Amarendra Bahubali (Prabhas) and beautiful princess Devasena (Anushka Shetty). They render the first half exasperatingly sluggish. In the second half the film gathers momentum but never manages to free itself from the spirit of randomness that informs its core. ‘Baahubali 2’ is, firstly, a stand-alone film. The Conclusion doesn’t preclude the audience that hasn’t caught The Beginning. It is in fact a much, much better movie, and one rarely says this about sequels. What has drawn you into the theatre already is the action, special effects, and scale of production—all of which was a given, and there is no disappointment on that front at all. For an Indian movie, you’re equally stunned into absolute disbelief. Baahubali 2: The Conclusion does leave a few questions unanswered. Bhallaladeva’s son Bhadra was beheaded in The Beginning, but while over an hour is dedicated to Baahubali-Devasena’s union, there is no mention of Bhallaladeva’s wife. There is a mention of a civil war-like situation in the event that Amarendra Baahubali is killed, but the subjects meekly accept Bhallaladeva’s tyrannny without protest, except the tiny rebel group that Avanthika (Tamannaah) was a part of. The film presents the old-as-time conflict between good and evil, the classic trope of mythology. But watch the film for the grandeur, the visuals and the performances, that have you cheering for Baahubali, much like the subjects of Mahishmati. From the cast, Prabhas as Amarendra Baahubali, this film is probably his best work to date and will remain memorable for his fandom till ages. Rana Daggubati is absolutely terrific as the menacing Bhallala Deva who infuses the evil at will making BAAHUBALI the promised spectacle we have asked for. Anushka Shetty as Devasena is simply superb; she has the looks, the poise and the attitude for the role of a warrior princess who knows her rights. Ramyakrishna as Sivagami is terrific indeed. Sathyaraj who plays Kattappa gets a ‘lot’ to do over here and he is just brilliant. Nassar is viciously wicked. Prabhas, playing both, the brave warrior and fearless son, is committed to his character. But this is surely Ramya’s film and she is formidable as the fierce Sivagami. Anushka Shetty as Devasena is flawless as the princess who crosses swords and has her way with words too. Sathyaraj, as the sutradhaar of this epic tale, Kattappa, is distinguished in this sequel as his character handholds the story and even gets a chance to play wingman to the romantic lead. Rana Daggubati as Bhallala Deva channels sufficient evil and serves as a determined adversary in the fight sequences. Baahubali’s cast has fit into the narrative so well that it will not be surprising if Daggubati, Sathyaraj or Prabhas are identified as Bhallaladeva, Kattappa or Baahubali for some time to come. Daggubati holds the screen together with his persona of the evil all powerful king and manages to hinge the tension around him. Ramya Krishnan is powerful as queen mother Sivagami. The slow motion capture of scenes is exactly what you will see in great graphic novels. You will gasp and sigh and clap (even when you are watching the movie in an uptown multiplex). Watch it on the biggest screen near you. The joy of watching an epic fantasy film will be complete. Overall, ‘Baahubali’ is just an overrated piece of art but, at the same time, holds good entertainment value for the ardent fans of the franchise. Few films outlive reviews and ‘Baahubali 2’ is one of them. And that brings me to Prabhas, the only one who doesn’t drown in familiarity in a story which doesn’t know when to stop. He plays Baahubali, he of great strength, with as much verve and vigour as in the first part. Striding across the screen, his `dhoti’ and vest and armour all in the right place, he comes across as the perfect action hero, complete eye candy, and the biggest strength of the film. I enjoyed the first part enormously. The second one comes to life only intermittently. Leaving the theatre, you can’t help wishing that Kattapa had killed the fellow earlier, for us to get a tighter, more economical and perhaps sharper conclusion. ‘Baahubali’ could not have been made without SS Rajamouli’s magical touch and vision. It was the director’s sheer commitment and hard work that our nation is blessed with a movie like this. You will be amazed to know that ‘Baahubali 2’ is not only about special effects. In fact, emotions form the soul of this film. ‘Baahubali 2: The Conclusion’ will also offer you a lot of reasons to celebrate. The film is so grand, so larger-than-life and so visually appealing that you will be imprisoned in your seats from the opening credits onwards. It is quite evident that a lot of hard work and effort has gone into every frame. The cinematography, the special effects and the choreography of the war scenes are totally awe-inspiring (though the special effects in a couple of scenes come across as too fake) and will bring to mind Hollywood blockbusters like ‘Troy’ or ‘300’. There are times Baahubali shows the strain of expectation, especially in the second half’s doddering pace, lacklustre combat and excessive, unconvincing use of VFX but when it communicates from a place of heart, it moves and enthralls. 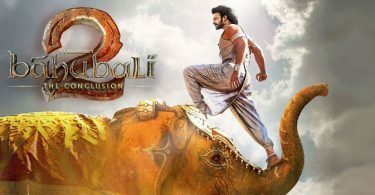 Better viewed as a whole instead of parts, Baahubali is a spectacular achievement, which not only deserves its place in history but also proves filmmakers should dream big and more often. The simplistic, predictable story is the chink in the film’s armor. But it has to be said here that Rajamouli is a consummate craftsman who sweeps you up in the filmmaking. He skillfully uses every tool at his disposal, including rousing background music, slow-motion technology, clap-trap moments, and fantastical flights of fancy to transport you to the world of his characters. It’s impossible not to be impressed by a magnificent, larger-than-life coronation sequence. It’s hard not to cheer when a key character avenges an insult to a woman’s honor. There is also a ship that flies, a stampede of bulls with horns on fire, and palm trees that are used as catapults in a battle scene. There is virtually no stopping Rajamouli’s incredible imagination. The movie is bit lengthy and needed to be trimmed down in middle portions. In terms of novelty factor there is nothing much new to be seen in terms of visual treats. The songs might not be memorable or foot tapping. One does expect the filmmaker to show an epic style of battle in the end and thus ends up with a minor underwhelming feeling. Rana Duggubati was good, but not as required. Rana does looks great in terms of his physical appearance. Tamannaah was hardly there in the movie. Rajamouli’s period drama flaunts characters who are confounded by a fate far larger than their fighting abilities. The war sequences, fearsome and awe-inspiring beyond anything we’ve seen in Indian cinema and shot by cinematographer K K Senthil Kumar with a penchant for lavishness that goes well with the film’s deliciously ripened feel flavour fervor, show not just the character’s valour and heroism but also expose them to be vulnerable mortals who, for all their deified posturings, are susceptible to the rules of mortality much in the same way that we ordinary mortals are. Portraying a world of larger-than-life, mythologized and anointed by a destiny that disperses drama, Rajamouli takes us on a journey so grand, epic, enchanting and unforgettable that it would be impossible for us to look at any other costume drama with respect, let alone awe. Some Films dont depend on reviews .. It is Audience who choose that they want to watch or Not. Bahubali is the film who dont need to good review or bad. no doubt this film is near close to hollywood VFX Films. Anushka Shetty is Brilliant and delivers the best performance of Baahubali 2.
nice movie ! but it makes me sad to se raees at only 2.9 it deserves 4.0 ! a masterclass movie enjoyed it throughout !! No 300 cr in Hindi. Strictly average film. Not even close to first. They should spend some time on plot instead of action. Why katappa killed bahubali? How people maniac about filmy stories? It’s just stupidity. Why katappa killed bahubali? How peaple maniac about filmy stories. It’s just stupidity. A big request to indicine team, please don’t add review of stupid critic like shubra gupta , i guess they asked for money to give good reviews but rajamouli denied so, they are taking out their personal matter out here. Want again a series if possible. NDTV is a bakwas reviewer. Never read their review again. I watched it today afternoon… It’s epic and mile high from regular bollywood movies… VFX are just incredible… Story screenplay everything is just outstanding…. Today I fall in one side love with anushka Shetty she is very beautiful iful in movie…. Watch only in theater… It’s a visual treat. High time to fire shubra gupta from critics. She had found Dangal decent and bahubali 2 poor. If you don’t like Brilliant cinema than who made you a critic. Watched Baahubali in Tamil.Just one word AMAZING.It isn’t a film but an experience.The emotional scenes stands out in the second half.It’s a proper Indian movie made for the Indian audience who want to be entertained in cinema and Baahubali will satiate every section of the audience. Prabhas is brilliant so is Anushka and Ramya.The confrontation scenes between them have been executed very well.It will be the biggest blockbuster in the history of Indian cinema. And please don’t watch its pirated version.It has to be experienced on the big screen.Movies like Baahubali are once in a decade experience.Don’t miss it. I know every time HT and IE wont give good rating to any film other than Khan. See there are pattern with such critics they can come down average rating drastically for any film other than khan.